BWS WOMEN IN HOSPITALITY & TOURISM AWARDS 2019- We've been shortlisted! The Finalists have been announced for the Women in Hospitality & Tourism Awards 2019. Vikki has been shortlisted in the Bar/Cafe/Restaurant of the Year category. For those who don’t know BWS connects, empowers & supports business women across Scotland including a bi-monthly magazine, business roadshows & awards celebrating women in business. The aim of the awards is to help recognise & increase the number of women working in senior leadership roles across the visitor economy. The awards look to put the spotlight on women who have made an impact in their industry through innovation, best practice & delivering outstanding results. There are 15 categories to ensure all the unsung heroes get their chance to shine. Since opening thirteen years ago Vikki has very much enjoyed her job in hospitality. She’s been tweaking things here and there to ensure The Wee Restaurant is always evolving whilst remaining the relaxed & friendly place to dine that it is famed for. Three years ago the second Wee Restaurant opened up in the Frederick Street in Edinburgh. Although The Wee Restaurant in Edinburgh is not the neighbourhood restaurant like the one is in North Queensferry, Vikki & Craig very much still wanted to have this neighbourhood feeling. It doesn’t matter which restaurant you choose to dine at everyone is greeted as a friend. Vikki & her team working very hard to ensure everyone is very well looked after & has a thoroughly great time whilst dining. Training of all staff is very important to Vikki. She doesn’t tend to employ the finished article but enjoys fostering confidence in staff & watching them grow within their role & beyond. Over the years she has seen her younger part-time staff blossom from someone who struggles to hold a plate whilst talking to a customer to someone who can work independently & expertly manage shifts in her absence..This is one of the most pleasurable parts of her job. Many regulars like to see this personal growth too & are always interested in the goings on in staff lives, like we are of theirs. We’ve been to weddings, birthdays, christenings and unfortunately a few funerals of our guests. Vikki & the team are truly blessed to be included in our guests lives. Fingers crossed for Vikki on the 16th of May & here’s to the next 13 years & beyond. To see the categories & shortlist click here. Both restaurants are open on Easter Sunday for lunch from 12 - 3pm. MEET GEORGE & HIS SCRUFFY DOG! Over the last 13 years we have been asked for cider on occasion, so we’ve been out & about to source one for our customers. In the past we have never quite found exactly what we have been looking for. Last week that all changed when we met George (minus his scruffy dog Ozzy) at a Food & Drink Scotland event. George’s plan to start producing quality craft cider was hatched in spring 2016 and that seed of an idea flourished when he visited some great craft cider-makers in Herefordshire and Gloucestershire. He returned home to Perthshire totally inspired and determined to launch their own brand of cider. George set up Strathearn Cider Company in the autumn of 2017 and shortly after that he left the Scotch whisky business where he had worked for 14 years. They are delighted to be working in partnership with a fantastic cider maker in Herefordshire and to be using apples from Perthshire and Fife in our ciders - including from Comrie Community Orchard at Cultybraggan. TIGER'S EYE IPA-NEW LOCAL TO GET TO KNOW AT THE WEE RESTAURANT! The Wee Restaurant is proud after 13 years to serve an IPA to customers. We love to source local independent producers & then work closely with like minded individuals to bring our customers something a little different. 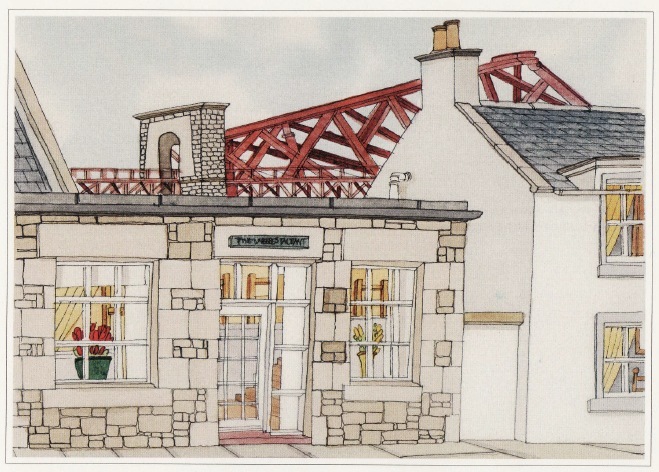 Inner Bay is produced by Kate Russell at her local micro brewery in Inverkeithing. Established in 2016 after Kate was looking for a new project that would find a work/family balance as well as make use of her microbiology background and managerial skills. Husband Jed Martens was already an avid homebrewer so after much discussion & sampling of craft beers, they decided to join the craft brewing. 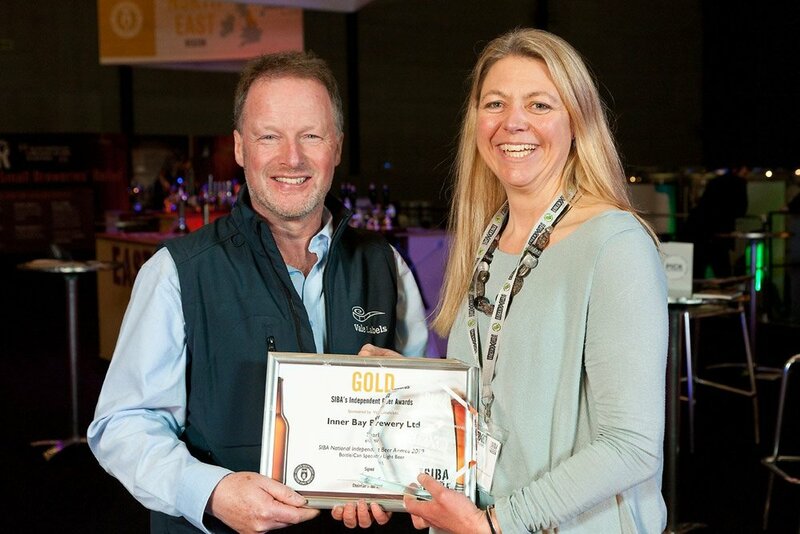 Since 2016 Inner Bay Brewery has gone from strength the strength winning a host of awards at the SIBA Independent Beer Awards. Only this week Kate won a Gold Award in the speciality light beer catagory for her traditional Bavarian wheat Beer-Pearl. The beer was recognised for its zesty fresh finish. We have chosen to stock the Tiger’s Eye IPA. A deep golden colour with rich aromas & tropical fruits. 6.5% ABV. It has proven very popular in the month or so of it being stocked in our North Queensferry restaurant. Hence with it proving so popular in Fife we are rolling it out to our Edinburgh restaurant so the good people on the other side of the Forth can enjoy Tiger’s Eye too! It's time to spoil mum on Sunday 31st March. We'll be open from 12-3pm at both restaurants serving an a la carte menu plus home-made fish goujons & chips and ice cream (£10) for the under 10s. Plus all mums get a free glass of fizz! We’d like to introduce you to our new manager at The Wee Restaurant in Edinburgh. Nicole Richardson joined us in November last year. “I got into the hospitality industry as a teenager working as a waitress whilst studying business management at Napier University. After 6 months travelling in New Zealand, I returned to Scotland and was offered a job at The Peat Inn in Fife. During my time there I realised that I enjoyed learning about all the different elements that create a great dish of food, as well as discovering a love of wine. As well as food and wine, I also love all the different people you get to meet in this industry, as customers as well as colleagues. At The Peat Inn I was privileged to serve Andrew Fairlie, and Bear Grylls once stayed at a hotel I was Duty Manager at. Working at The Wee Restaurant is a little different than my previous roles. It’s great working closely with Vikki and Craig and to learn from their vast experience in looking after guests and keeping such high standards. While global warming is yet to provide aspiring Scottish viticulturalists with the opportunity to cultivate vines in this country, in Jamie McCulloch’s produce we have the next best thing! Jamie, originally from Edinburgh, founded his winery, ‘Les Deux Cimes’, in the Swiss Alps in 2007, one year after completing his oenology studies. He was attracted to working in this alpine region by its very particular mountain terroir that provides great scope for experimenting with a number of different grape varieties. The wine scene in Switzerland is refreshingly populated, in the most part, by small independent wineries. Over the last few years, the quality of production has risen dramatically, yet due to the small amount of wine produced, only about 2% of overall production is ever exported. At The Wee Restaurant, we are fortunate enough to have an allocation of Jamie’s great wines. Jamie’s Fendant, the Swiss name for Chasselas, is a great alternative to Sauvignon Blanc – fresh and zesty with juicy yellow plum characters and a herbal, savoury finish. Only 1000 cases made every year! Our wine of the month is a delicious Gamay, produced by renowned Scottish hotelier David Levin and his Australian wife Lynne at their organic winery in the Loire Valley. Their wines showcase a blend of French terroir manipulated using new world winemaking techniques. The organic viticultural practices used by the winemaking team ensure that the resultant wines display wonderfully pure fruit, showcasing the freshness which has become a hallmark of Loire wines. The fact that David owns 19 distinct vineyard plots, over two different types of terroirs, allows the estate to experiment during the blending process, consistently delivering wines that are balanced and complex. This bright purple Gamay holds pure Loire Valley expression in its aromas of lavender, violet, cherry and chocolate. The red berry flavours mix it up with some butterscotch and spicy savoury characters followed by a silky, textured finish. David and Lynne describe their style as an amalgam of Old World tradition and New World finesse that they have crafted on their three vineyard sites of Oisly, Choussy and Bourre. We’re excited to be stocking the UK’s first light craft lager. GEN!US is brewed to craft quality but with less alcohol and lower calories. Zesty and refreshing, it’s not just ‘smart drinking’…it’s genius! Genius Brewing is proud to donate 5p from every can of Gen!us to the My Name’5 Doddie Foundation founded by Scotland rugby legend Doddie Weir who has Motor Neurone Disease. Find out more here. Vikki Wood recalls the journey from opening The Wee Restaurant in North Queensferry over a decade ago, to today. It seems like a long time ago now, but in late 2005 we were looking for a bigger home for our growing family with a third child on the way. 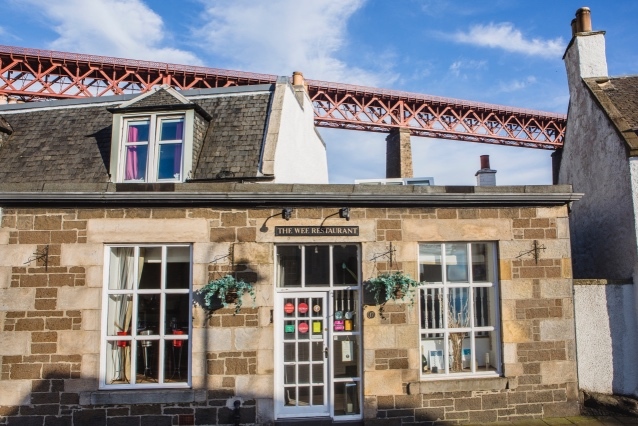 We stumbled upon 17 Main St in North Queensferry, and despite my worries that the house was actually smaller than were we were living, we went ahead and bought it! 17 Main St had been a restaurant previously but when we bought it, it resembled an old potting shed with the ‘commercial’ kitchen containing only a cooker switch inside the carpeted and wood-chip-walled room. After two months of renovations and only two weeks after the birth of baby number three we opened The Wee Restaurant’s doors in March 2006. Craig had worked in hospitality since supporting himself through university by being a kitchen porter at The Maybury in Edinburgh. He worked his way up through the ranks working at Restaurant Martin Wishart, Loch Lomond Golf Club, The Outsider, The Crinan Hotel and on the Royal Scotsman luxury train. And I had worked in psychiatry for 10 years when we decided to take the plunge and become self-employed. A decision made to improve the time we could spend with the children. At the time our eldest Ethan was 7, Zoe was 3 and Innes was just a wee baby. It was a scary time to double our mortgage with no security from a wage, but we’ve never looked back. From the word go the villagers of North Queensferry were very supportive of the restaurant and word quickly spread of a new place nestled under the Forth Rail Bridge. Over the years we’ve been honoured to see new customers become regulars, and regulars become friends. In 2015 we decided life just wasn’t hectic enough, so we had an idea to open a Wee Restaurant in Edinburgh. Never ones to hang around on an idea, within a few months we had the keys to 61 Frederick St. There have been a few times over the past two and half years that we have asked ourselves “what have we done?”, but in general it’s been a great experience. It all seemed a bit easier the second time around, we learned from the mistakes we made the first time. And not being pregnant/new parents helped massively! Over the years there have been several tweaks to both restaurants from just learning on the job but also taking into account feedback from customers. Our ethos has always stayed the same. We want to serve simple good food and fine wines in a relaxed atmosphere. We are a family-run restaurant who care about service, quality of produce and the cooking of Scotland’s seasonal offerings. We work with staff who are passionate and have the same outlook. Along with our fantastic staff we have more of the Wood family now working in the restaurant. Little 7-year old Ethan has grown up and is now at university. After working as a pot washer initially for pocket money, he came front of house 5 years ago and is now the part-time Assistant Manager in Edinburgh. Zoe is almost 17 and works part time in the North Queensferry restaurant when not studying for her Highers. Little baby Innes has turned 12 and has been pot washing to help pay for a trip to Alton Towers. Sophie, our niece, joined the front of house team part time in Edinburgh team at the start of the summer and is thoroughly enjoying it. She has been squirreling away her wages to help pay for a trip to South Africa with school. We’re also proud to have Kirsty, Sam, Debora, Adelin, Joshua, Louis, Simba, Nikki, Mikey, Roberto, Adela, Radek, Isabelle, Keri and Siobahn working alongside us. We love our big ‘Wee Family’. We're delighted to be hosting a special fundraising dinner at The Wee Restaurant Edinburgh on Monday 17th September in support of this very good cause. The Chesney Trust raises money to maintain, develop and run a secondary girls’ boarding school in Engcongolweni, Malawi. Mary Erskine School in Edinburgh has been supporting the school for several years by raising funds, and donating second-hand school uniforms and sports kits. Every two years a group of girls visits Malawi to join in with lessons, and also to help build and paint the buildings, and look after the nursery children. This year, twelve 5th and 6th year girls and two teachers are visiting the school in October. To help raise some money, the girls will be preparing a fabulous 4-course dinner (with a little guidance from Craig!) in our kitchen, and will be serving each course with matching wines - with all proceeds from the night going directly to the school in Malawi. If you fancy enjoying a delicious dinner whilst supporting a good cause, please call us on 0131 225 7983 to book a table. We look forward to welcoming you at both restaurants over the festive season! Join us for an intimate dinner, for a get-together - or you can take over the whole restaurant! Both Edinburgh and North Queensferry comfortably seat up to 40 guests. Take a look at our Festive Menu here which will be offered at lunch and dinner at both restaurants from the 4th to the 23rd of December (except Mondays). In addition, we'll also be serving a special Menu Du Jour in both restaurants throughout December. We are open from 5pm - 11pm, with last orders at 9pm, at both restaurants. Click here to view the menu. Wine is a very important part of our offering at The Wee restaurant and no one is more passionate about wine than our Chef Proprietor, Craig Wood. Below, he tells us about his favourite wines. We change our wine lists a couple of times a year. Although not seasonal, there’s a notable difference in customers' preferences during the summer and winter months. In the summer we all crave a crisp white wine, while the autumnal and winter months makes us long for much heartier reds. Our customers’ personal preferences also play a huge role in what we choose for our lists. We recently added a few really special wines that we know our regular customers love. Let me tell you a bit more about a couple of wines on our list that I particularly enjoy. Rosé, Domaine Rimauresq, Provence, France 2016. It’s crisp, it’s elegant, and I love the delicate floral and raspberry notes. It comes from the highly-acclaimed Cru Classé vineyards, overseen by the brilliant Pierre Duffort. It’s no surprise that Domaine Rimauresq has been lauded by critics in recent years for its excellent produce as Pierre leads a team of excellent winemakers. In fact they’ve been cited as being at the top of their game in the Guide Hachette, the well-known French Encyclopaedic wine guide, three times. Named after the river which flows through the heart of the estate, the Real Mauresqué, Domaine Rimauresq is the home of nine grape varieties that are cultivated to produce red and white as well as rosé wines, which are known for being slightly darker than many other examples of rosé from the region. Pinot Noir, Les Deux Cimes, Valais, Switzerland 2016. I’m a huge fan of Les Deux Cimes and am fortunate enough to call its owner Jamie McCulloch a good pal. I’ve been lucky enough to have enjoyed quite a few trips to his winery and vineyards in Switzerland. He produces his wines with great passion, and is involved in every step of the process in a really hands-on style. This is not your typical light French pinot noir. It’s smooth, slightly spiced and lightly oaked and is perfect with steak or Scottish game. It’s good enough to open a bottle after a hard week in the kitchen and enjoy on a Sunday evening. Originally from Stirling, Jamie headed to the Swiss Alps in 2007, a year after completing his oenology studies. Perhaps not the most obvious location for setting up a winery, but Jamie was attracted to the scope the alpine region offers for experimenting with a number of different grape varieties. I love that the wine scene in Switzerland is populated, for the most part, by small independent wineries. Over the last few years, the quality of the produce has risen dramatically, yet due to the small amount of wine produced, only around 2% of overall production is ever exported. So we feel very privileged to have Jamie’s wines on our list. He’s always such a wonderful host when we visit, and that can quite easily lead to a little over-indulging. But as a chef and restaurateur, I believe it is very important to taste the products! I’m looking forward to visiting Jamie again later in the year for more tasting and a game of golf on the nearby Crans-Montana Course. And perhaps another glass of wine or two! Our current highlighted wines hail from South Africa and Spain and have been selected by Philippe of l'Art du Vin to complement our summer menu. And, we're now offering Janisson Champagne by the half bottle. Ideal if you don’t want to indulge in a whole bottle, and perfect for that mid-week treat! Having established his base at Vriesenhof, Springbok hero Jan Boland Coetzee took control of a separate area of vines in order to add the more accessible Paradyskloof range of uncomplicated, fun, easy-drinking wines. Produced from hand-picked grapes, the intention for these wines was to make them playful and accessible, yet ensure that they accurately depict the individual characteristics of the Stellenbosch terroir. The ‘Unwooded Chardonnay’ displays fresh citrus notes, with green apples and refreshingly crisp acidity. Both are £6.75 for a 175cl Glass, £8.75 for a 250cl Glass and £26.00 per bottle. You can now 'Click & Collect' the award-winning Isle of Harris Gin at both our restaurants. We've been serving Harris Gin in our seasonal aperitif and love it. It's a complex gin, featuring nine carefully-chosen botanicals that capture the elemental nature of the Isle of Harris, particularly the maritime influences of the seas which surround it. Absolutely delicious served simply with tonic and a twist of orange. Now you can get hold of your much-loved bottle of Isle of Harris Gin without delay! Click here to place your order and it will be ready to collect from us within minutes of receiving your confirmation email. Just bring your receipt along to us during our opening times for collection. Your bottle comes gift wrapped and with a little card telling you all about the gin. We also stock Sugar Kelp Aromatic Water to add that extra taste of the Outer Hebridean seas to your tipple.